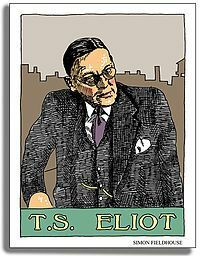 File, drámadóir agus criticeoir liteartha iomráiteach a bhí i Thomas Stearns Eliot (26 Meán Fómhair 1888 – 4 Eanáir 1965). I measc na rudaí is mó cáil a tháinig óna pheann ná na dánta The Love Song of J. Alfred Prufrock, The Waste Land, The Hollow Men, Ash Wednesday and Four Quartets; na drámaí Murder in the Cathedral agus The Cocktail Party; agus an aiste Tradition and the Individual Talent. Bronnadh Duais Litríochta Nobel air sa bhliain 1948. Rugadh Eliot sna Stáit Aontaithe, ach bhog sé go dtí an Ríocht Aontaithe sa bhliain 1914, agus é cúig bliana is fiche. Thóg sé saoránacht Bhriotanach sa bhliain 1927, ag aois naoi mbliana déag agus fiche. A Choice of Kipling's Verse (1941) déanta ag Eliot, le haiste ar Rudyard Kipling, London, Faber and Faber. Tugadh an leathanach seo cothrom le dáta an 12 Meán Fómhair 2015 ag 00:00.